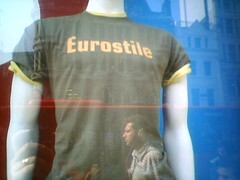 Passing the Oxford Street UniQlo today, I saw this T-shirt. It's an official Linotype-licensed shirt - and it's using the classic display font Eurostile (well, actually Eurostile Bold Condensed, which probably wouldn't have fitted on a T-shirt...), possibly my favourite font of all time (yes, even more than Albertus!). So I had to buy it (though in traditional geek black). I also picked up one that used Stop. I want one. That is too geeky to be true and I want one. Perhaps we could sort something out! First born mail child, perhaps? If you ever buy one emblazoned with Comic Sans MS do we have permission to shoot you? I think Stop is bad enough, don't you? Taste-police - arrest that man!